VENDANGES 2016: Whites sorted by hand. The harvest is over! it is not less than 30% of our cultivated areas. So it’s Vermentino, Marsanne, Viognier and Grenache gris that have been harvested by hand. As every year, our grapes are sorted by hand for the realization of our high-end wines; always in order to respect our line of work, our breadcrumb, all our work, aims at producing FINS and ELEGANTS whatever their position in this pyramid. 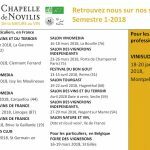 Do you want to follow news in CHAPELLE de NOVILIS? You can therefore visit our news section regularly; Or you can follow us by liking our facebook page.